I have to admit that I didn’t read the full description of this session, and thought it would be more along the lines of “what kind of students do colleges look for”, but I was pleasantly surprised to find out what it was really about. The purpose of the session was to reveal the findings of Inside Higher Ed’s annual survey (in conjunction with Gallup) of admission deans. You can download the full report at their website. The focus of the survey and the presentation were on the difficulty of meeting enrollment goals, the “Trump Effect” on international recruitment and retention, and efforts to increase racial and ethnic diversity on campus. There was also brief discussion of challenges facing liberal arts institutions, rising student debt and the move toward “free” tuition at public institutions. The survey goes into depth on these and other topics and is worth the read. 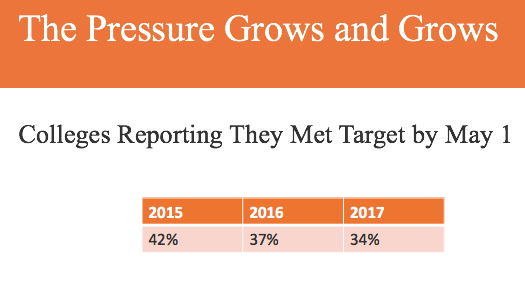 The survey was sent to 3,547 admissions directors and enrollment managers, of whom 13% responded. 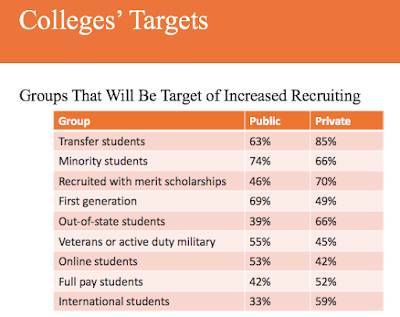 The respondents came from 200 public institutions, 245 private ones, and 8 for-profit schools. 13% sounds kind of low, but if you’ve ever given a survey you know that it can be hard to get people to participate fully. This was quite surprising, and led to an interesting discussion. Scott observed that “if you didn’t meet your goal by May 1 you’re the norm in higher ed”. He noted that the joke in the field is that “June 1 is the new May 1” and that some have argued that SEPTEMBER 1 is the new May 1. The panelists tried to discuss this development and the conclusion seemed to be that the enrollment goals that are being set (sometimes by offices higher up the chain from admissions) are unrealistically high. Plus families seem to be waiting longer to send in deposits (perhaps to try to play institutions off each other). Regardless of why, Scott noted that he feared that “some institutions will be pressured to do unwise things” to meet their goals by May 1. In response to an audience question, Scott noted that they will ask more questions next year to try to elicit just how “realistic” admission goals are. 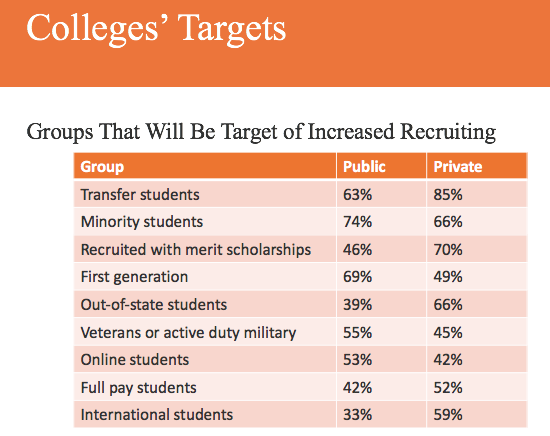 The only sector that overwhelmingly met their enrollment goals was public doctoral institutions. Reasons could range from the large number of in-state students for whom these are the “first-choice” schools to the (perceived) prestige of these universities by international students and their families. Scott noted that even as states have eroded their support for universities, these institutions have great advantages in fundraising, donations, applicant pool and federal grants for research. I was very surprised to see the increased attention that private colleges plan to pay to transfer students; I mean, the pool of college age students may not be growing as rapidly as it was a few years ago, but overall enrollment in colleges continues to grow year over year. This effort to harvest transfer students represents almost a Malthusian world view that seems to reflect a zero-sum competition that I’m not sure exists. Also telling is the comparative de-emphasis on the part of private colleges and universities on veterans and minority students. It almost seems that public colleges and universities are more comfortable with diverse student populations compared to the privates. At this point I want to point out that I was impressed by Scott’s willingness to inject politics into the discussion. I personally believe that every topic is a political topic, but I can imagine that some people might have been nonplussed by this. Scott passionately addressed the data on the preceding chart by saying “We should think about these priorities. If private college’s emphasis is non-need based merit aid, are they really going after the population not currently represented in American higher ed? Colleges measure demonstrated interest by favoring those who visit. But this has an obvious, unstated economic meaning–wealthier kids can afford college visits more.” Especially since the topic of access to higher ed was a major theme of the conference, I welcomed Scott’s focus on this issue. This was quite interesting to me. I was a college counselor for eight years at a boarding school with a substantial international population and in many cases their default was to consider large public universities. 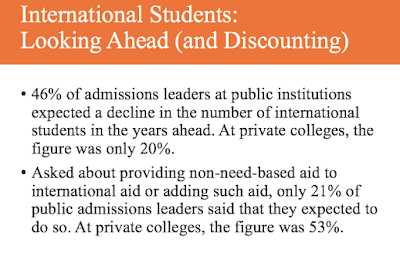 But the leaders in the field clearly seem to be ceding international students to private institutions who in turn are preparing to pay heavily to increase international enrollment. Could this be due to a backlash against international kids at publics? Or could it be a “Trump Effect” that predicts a generally more hostile environment for immigrants? 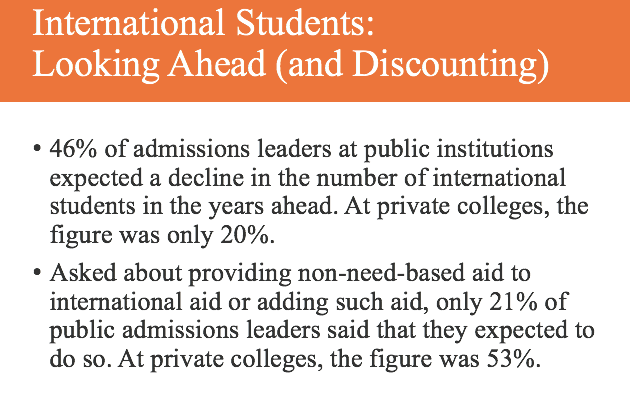 It was noted that international enrollment was flat this year, and expectations are for it to fall this year; apparently some schools are down 20-50%. Considering how many places depend on full-pay international students to help finance their discounts to American students, this could be a looming financial disaster for some schools. Related to this is another side of the “Trump Effect”: a concern that too many colleges (and college towns) are “excessively liberal”. Apparently, independent consultants have reported that more parents are vetoing college choices due to a worry about the political views of the campus and area. Scott asked us to consider what it means when people perceive higher education this way. Personally, I don’t think this is new. Deriding someone as a “college boy” (implying an effete elitism out of touch with common people) goes back for at least a century. That said, it is no secret that college populations (and university towns) are often isolated blue islands in the overwhelmingly red American landscape; this of course explains Republican efforts to disfranchise college students. The twin topics of liberal arts colleges and student debt were addressed in an interesting way. Apparently, only 8% of students and 9% of parents “understand the value of liberal arts”. 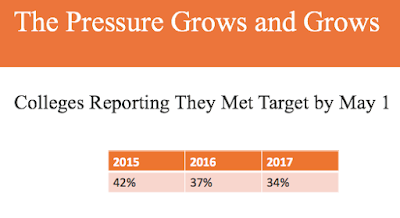 As a result, there is overwhelming pressure to focus on college as a “pre-professional” education. Tied with this is the idea of getting one’s money’s worth and fear of graduating with debts no honest man can pay (as Bruce Springsteen would say). 36% of public institutions and a startling 78% of privates believe that “public discussion of student debt has discouraged applications to my college”. Wow. The only conclusion I have is that these limousine liberals running private colleges are probably secretly happy that Bernie Sanders’ “free public college for all” idea didn’t go anywhere! After the data was presented, Mary Ann Willis and David Hawkins spoke briefly. Mary Ann agreed that “the general public doesn’t understand liberal arts” and think college is for career preparation. She urged that admissions officers work harder to recruit students at smaller, rural schools like hers. She counseled that they shouldn’t make assumptions about who goes to these schools: “I have students with their family name on buildings, and I have some who are Pell eligible”. She also noted that at her school, kids apply to an average of 3.5 schools. Heavy stuff for sure! 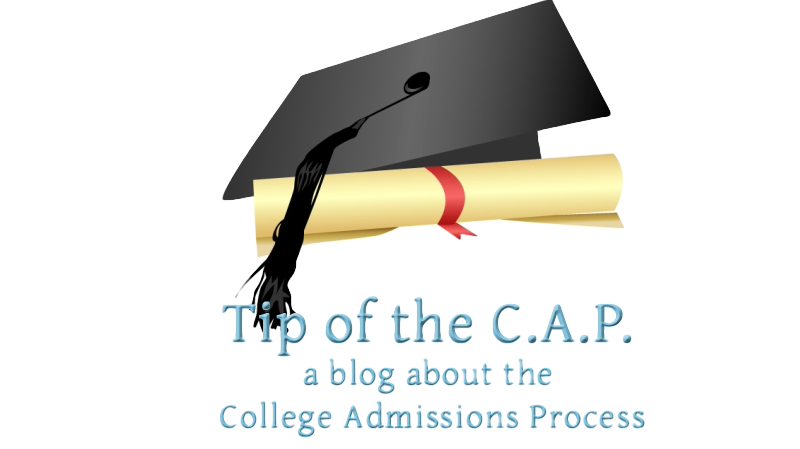 What have you or your students seen in your college admission experiences? Share your thoughts in the comments space below.